While in attendance at the July 16, 2018 Council meeting, we noted one item on the agenda whose timing was a little puzzling. This item was a recommendation from the “Working Committee Board of Directors for Niagara Power” with a list of the Town’s various hydro boards and individuals who were recommended to serve on them. Given that the election was just a few months away, we began wondering why 2 and 3-year terms appeared on the agenda and started thinking about these Boards of Directors. We are not going to attempt to explain the myriad of hydro companies (5 as far as we know) that the Town has, we could dedicate a whole long post on this alone and still not cover everything. For most of these 5 organizations, the companies themselves along with the Mayor and most of Council see them as “private” companies. Now that’s a little bit of a misnomer, yes they are private in the sense of not being publicly traded, but that does not mean there is any legal requirement to keep their operations and financials secret… especially to you, the taxpayer. Due to the concealment of what really happens in these companies, we can only take a look on the surface and what is more or less publicly available information. As such, for this post we will look primarily at Niagara Power Incorporated (NPI), although our observations can be extended a little to Grimsby Energy AKA the Biodigester and the other companies which are hidden from public scrutiny. But conversely, everything may be totally different and perhaps even more controversial, in these “private” companies… with no access to them, who knows what happens behind those closed doors. Five companies for Grimsby? Really? There is no justification for having all these different hydro companies, they could be amalgamated into one single, cohesive organization with one functioning Board of Directors. But what we really have now is just a carnival shell game, with people trying to guess what is underneath… except there is no prize for guessing right. As the Town is the ultimate shareholder in these companies, the Boards of Directors (BoDs) of them are a mix of “Private Directors” and “Shareholder Appointed Directors”. 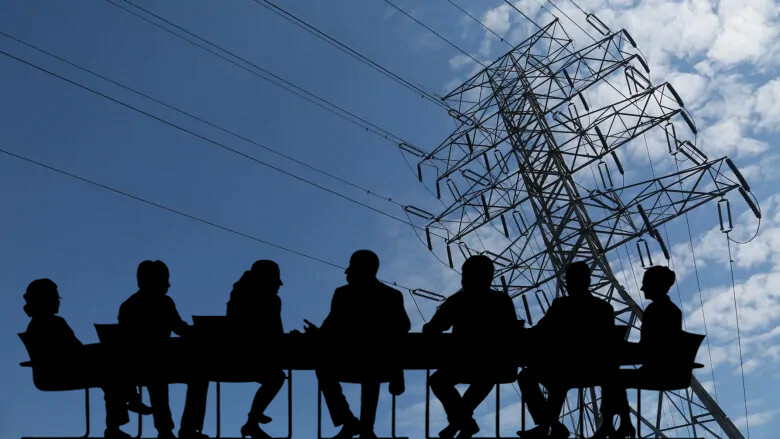 The first of which are private citizens, usually from the business community but not necessarily the energy sector that serve on one or more of the boards. The second class of Directors are members of Council, including the Mayor and select Aldermen who represent the Town as the majority shareholder on the BoDs. Council is the body that approves (or potentially disapproves) of the suggested list of appointees to the various BoDs, forwarded to them by the Working Committee at NPI. Before we look at the most recent list of appointees, lets take a look back at February 2017 where Council approved the following list of Directors to four of the five town hydro companies. 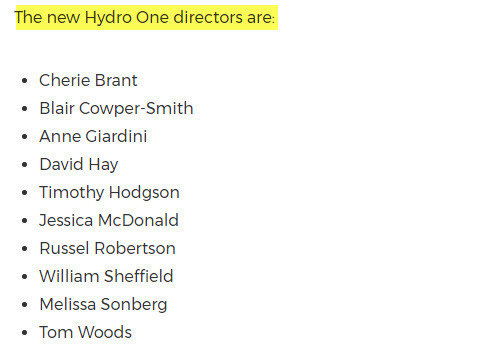 A fifth company, Grimsby Hydro, has never disclosed who sits on their Board of directors… which raises even more questions. 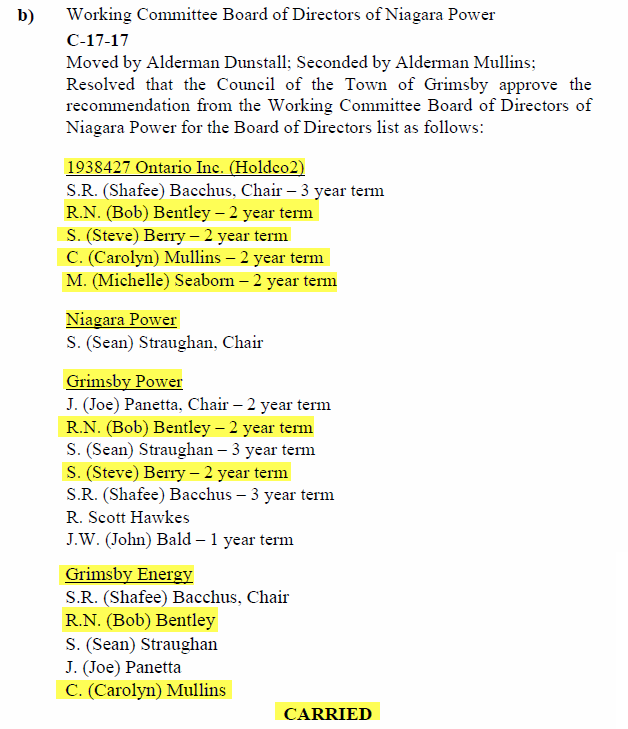 We have highlighted the other four hydro companies, 1938427 Ontario Inc. (Holdco2), Niagara Power, Grimsby Power and Grimsby Energy and the Mayor or Aldermen who were appointed to the boards. As a result of this February 2017 resolution from Council we have Mayor Bentley, Aldermen Berry, Mullins and Seaborn appointed predominantly for 2-year terms on the various hydro companies. This would have their Board tenures expire in February or March 2019, depending when those new boards were confirmed and formalized. So lets fast forward to July 2018. Well before the limits of the 2-year and 3-year terms were up and an election just a few months away, another list of recommended (re-)appointments is tabled into a mid-summer Council meeting. 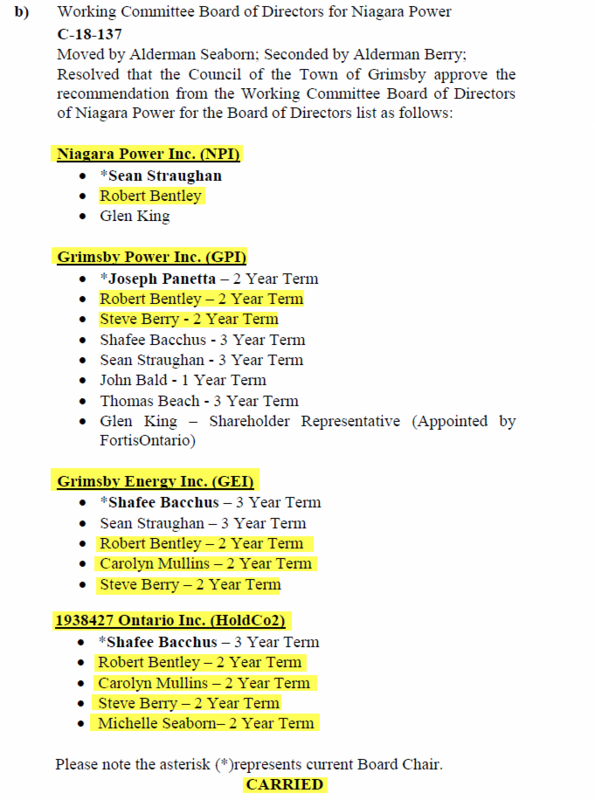 The list differs little from the 2017 appointments, Mayor Bentley was added to NPI (4 known Boards in total), Alderman Berry to GEI (3 known Boards in total), along with a Private Director from Fortis Ontario appointed to NPI and GPI and a new Private Director to GPI. There were a few changes in regards to the Private Directors in the 2018 list which needed to be addressed, but these have been done as single appointments in the past, not a whole list But as the 2017 appointment terms of the other Directors were nowhere near finished, they certainly did not need to be renewed. With an election only a few months away that has the potential to change the composition of Council and thus the membership on the boards, it makes no business sense to add new Directors from Council let alone re-fresh the 2 and 3-year contracts. These appointments/re-appointments could have waited until after the election or the next term of Council when the composition of that new Council is known. So why did Council see fit to do the re-appointments early? We will let you draw your own conclusions there. Essentially, if a Director on the NPI Board who is a member of Council is not returned to Town Hall by the voters they will be unable to serve as a Director once the current Council is dissolved. Again, we are not sure if the other companies have a similar provision. We tried to get shareholder agreements on these other companies with a Freedom of Information request, but other than compelling Town Hall to post the NPI Shareholder Declarations on their site (viewable here), we received nothing. Information has been communicated at a recent Council meeting that members of Council (including the Mayor) who sit on the hydro boards are not financially compensated personally, but the Town receives monies for their service that is then donated to charity. So we thought we would look into where this was stipulated and who got what. Now, the most current shareholders agreement is from 2009 but as stated above we wanted to look at the 2006 version first to see what, if anything, had changed in terms of Directors and compensation. The differentiation between Council Designated Directors and Private Directors. The language that says Council members acting as Directors will not be compensated and that the Town will invoice NPI for their service on the NPI board. The exact dollar figure as to what is being paid out for compensation to the various Directors. According to the current NPI agreement and in theory, the Mayor and Aldermen serving on this Board could be paid personally for serving on the NPI Board rather than the Town receiving their fees. We are not saying this is the current state of affairs, but from a procedural standpoint it could occur. We accept the Town’s declaration at Council that this compensation is being turned back to the Town’s coffers for charity and there is indication in the 2017 Town financial statements that there is money coming in from this. However, without a proper line by line breakdown and disclosure of the corporate documents of the “private” companies, we do not know how much those Directors are being paid and/or what stipulations there are in regard to the Directors who also sit on Council. “in amounts sufficient to attract candidates with necessary qualifications and consistent with industry norms and standards for comparable businesses”. This wording was in the previous agreement, but specific dollar figures are now long gone. The new and current wording is quite vague… interesting is it not? Even if the Town could justify the need for 5 hydro companies, then why don’t we have some differentiation across the Boards of Directors. It’s pretty much the same faces more or less across all boards, I guess for the Private Directors it means more meetings, more annual fees… and we have the proverbial government trough at the municipal level. That is a total of 10 members. Hydro One controls assets of approximately $25 Billion, has over 5,000 employees and their Board of Directors is comprised of 10 people. 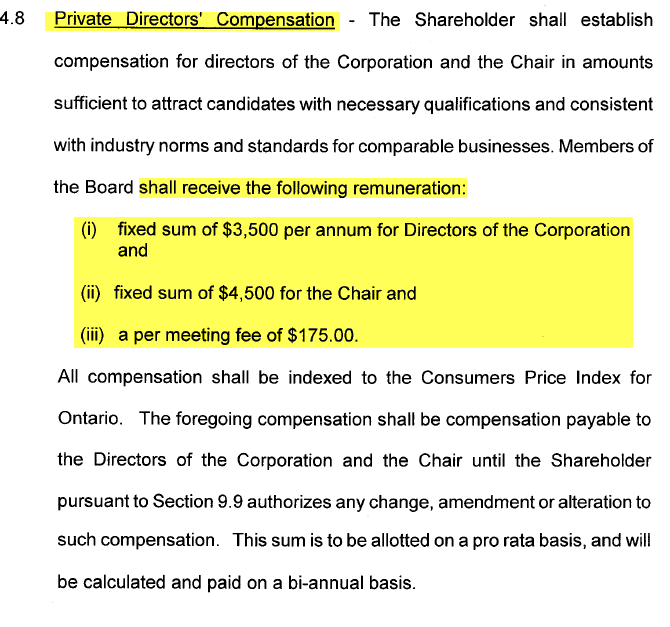 Of course the Hydro One Board positions pay more, but they have a much bigger ship to steer. For a regulated business with a monopoly, there fails to be any justification for having 8 people on the Board of GPI, unless there is something we do not know… oh wait, there is that secrecy “thing” again. As long as our current members of Council keep their silence on our hydro companies, we will have little insight into how good or bad they are being run. While NPI documents do provide some insight, most of the “real action” is kept secret in the companies submerged beneath them. The resulting number of Boards of Directors and the intermingling of both Private and Shareholder Appointed (Council) members between these boards is mind-boggling. The changes made to the 2009 NPI Shareholder Declaration are quite revealing. Rather than keeping the transparency the document had about who gets paid, how and dollar figures it was dropped in favour of a very “flexible” paragraph. Once again, that’s what we know about NPI… the other “private” companies may be similar, more conservative or even more generous in compensation terms for those who sit on the Boards. And why did Council see fit to reappoint the BoDs so close to the election? What is needed is a wholesale clearing of these Boards, bring in proper HR consultants who can hire an amalgamated Board that has proper executive management experience. Politicians with zero experience in the energy sector have no business being in the hydro business. With a proper and experienced Board comes good corporate governance and transparency, not the appearance of a country club. Now that electronic voting is underway, we ask you to ponder the whole hydro debacle and what those on Council, especially those sitting on the various hydro boards have done to keep your eyes wide shut. What is the real price of corporate secrecy… a few on Council know, but invoke the “private” business shenanigans if you ask them. Be sure to consider this when reviewing their job performance casting your ballot this election.